When the dust has settled, Chicago Bears fans will be pleased with the way the 2018 season played out as their side reached the postseason for the first time since 2010. After a slow start to their campaign, the Bears ended the regular season 12-4 and claimed the NFC North title. With momentum heading into the playoffs, many people tipped the Bears to go all the way to the Super Bowl in Atlanta, Georgia. However, a missed field goal against Philadelphia Eagles at Soldier Field denied them the opportunity to reach the Divisional Round. Preparations will already be taking place for the 2019 season by head coach Matt Nagy and general manager Ryan Pace. Here is a look at five reasons the Bears could be on course for their first Super Bowl appearance since the 2006 season. After being drafted second overall in the 2017 NFL Draft, there has been a lot of pressure on the young shoulders of quarterback Mitchell Trubisky but the North Carolina product has handled it exceptionally well and we are now starting to see the player who was so highly regarded in College football. Trubisky will be in his third year in the NFL in 2019 so he knows what the league is about now. The 24-year-old improved in every single category last season on his debut year stats. With 3,223 passing yards and 24 touchdowns, it was a solid return for a team which is not renowned for its offense. In his first ever postseason game against the Eagles, Trubisky threw for 303 yards, broke the franchise record for the most competitions in a playoff game and didn’t an interception. His performance throughout 2018 reinforces the view that the Bears finally have their franchise QB who they can build around for many years to come. There are many similarities between Trubisky and the LA Rams’ Jared Goff. The No. 1 overall pick in the 2016 Draft is set for Super Bowl 53 where his side are a best price of +120 with the bookmakers listed by Oddschecker on the game. Goff is shining in his third full season in the NFL and if Trubisky can follow in his footsteps in 2019, the youngster could also be getting his first taste of the biggest game in the sport next year. Arguably the turning point in Chicago’s season in 2018 came when they traded two first round picks to Oakland Raiders for the services of Khalil Mack. The outside linebacker is one of the best pass rushers in the NFL and has turned a very good defense into the best in the league. The good news for Nagy and Bears fans is that Mack is going to be suited in a Bears jersey from week 1 in 2019. Chicago had to settle for the number three seed in the NFC in 2018 which meant they did not get a first-round bye. In 14 games last season, Mack recorded 12.5 sacks, 47 tackles, 6 forced fumbles and an interception. The Bears will be hoping he can better those numbers next year and if he registers his stats of 2015, the Bears defense will be a tough task for opposing offenses in 2019. There is no doubt about what the priorities are for Chicago this year in the NFL Draft and off-season as they are desperate to add a wide receiver and tight end to their roster. Allen Robinson led the team in receiving yards in the regular season in 2018 with 754 yards but then the next best was running back Tarik Cohen who caught for 725 yards from the backfield. It is unlikely that the Bears will have the cap space to pick up someone up as high profile as Antonio Brown, however, they will definitely be looking to give Trubisky either a proven WR or one of the leading catchers in the Draft. When fit, Trey Burton is one of the best tight ends in the NFL, however, he missed the game against the Eagles in the Wild Card round and which was a big loss for Trubisky. Nagy may be keen to acquire some cover for Burton which would ensure the loss of Burton wouldn’t hurt them as much as it did in the post-season in the 2018 campaign. The defining moment of the playoff game against the Eagles this season was Cody Parkey’s 43-yard missed field goal. Overall, Parkey failed on 11 field goals in 2018, therefore, it is hard to see him returning as the number one kicker in 2019. Pace has wasted no time in bringing in Redford Jones who played at Tulsa but when undrafted. Jones was 12 from 16 on field goals and 44 from 45 on extra points in his senior year. He will be hoping to try and convince the franchise that he should be the number one starter once the new season comes along. If the Bears can find a kicker that they are comfortable with, it could help them win more tight games, Last season a number of their defeats could be put down to poor kicking. It remains to be seen is Parkey will still be around in 2019. If Chicago do choose to cut him, they face a $5.2 million salary cap hit, however, what is a must, the Bears need to have competition for that role otherwise there could be a repeat on what happened against the Eagles. Traditionally the NFC North has been one of the strongest divisions in the NFL with the Green Bay Packers having so much success over the last few decades. Last season both the Packers and Detroit Lions had losing records though and it is hard to see either of them being a threat anytime soon. Minnesota Vikings were fancied by my many people to be a strong contender to go all the way in 2018 after the acquisition of Kirk Cousins, however, they could do no better than 8-7-1. 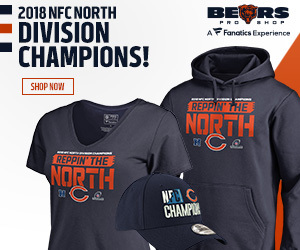 The Bears should be able to seal the division once again in 2019 which will put them in prime position once again for a shot at reaching the Super Bowl and then lifting the Vince Lombardi Trophy. The off-season can’t disappear quick enough for Bears fans as they will already be counting down the days until week one of the 2019 NFL season.